Survey markers, also called survey marks, survey monuments, survey benchmarks or geodetic marks, are objects placed to mark key survey points on the Earth’s surface. They are used in geodetic and land surveying. Informally, such marks are referred to as benchmarks, although strictly speaking the term “benchmark” is reserved for marks that indicate elevation. Horizontal position markers used for triangulation are also known as triangulation stations. The original mandate of the Survey of the Coast in 1807 was to survey the coast of the United States in order to promote safe maritime commerce. This first survey was the land area around a portion of New York Harbor. All sorts of different objects, ranging from the familiar brass disks to liquor bottles, clay pots, and rock cairns, have been used over the years as survey markers. In the 19th century, these marks were often drill holes in rock ledges, crosses or triangles chiselled in rock, or copper or brass bolts sunk into bedrock. The most common geodetic survey marks are cast metal disks with stamped legends on their face set in rock ledges, embedded in the tops of concrete pillars, or affixed to the tops of pipes that have been sunk into the ground. These marks are intended to be permanent, and disturbing them is generally prohibited by federal and state law. Starting in 1900, survey markers were often placed as part of triangulation surveys, measurement efforts that moved systematically across states or regions, establishing the angles and distances between various points. Such surveys laid the basis for map-making across the world. Geodetic survey markers were often set in groups. For example, in triangulation surveys, the primary point identified was called the triangulation station, or the “main station”. 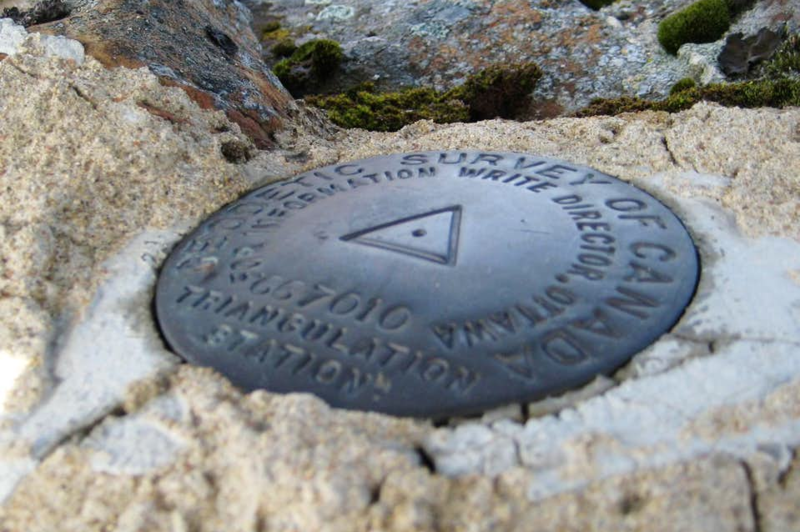 It was often marked by a “station disk”, a brass disk with a triangle inscribed on its surface and an impressed mark that indicated the precise point over which a surveyor’s plumb-bob should be dropped to assure a precise location over it. A triangulation station was often surrounded by several, usually three, reference marks, each of which bore an arrow that pointed back towards the main station. These reference marks made it easier for later visitors to “recover” or re-find the primary station mark. Reference marks also made it possible to replace or reset a station mark that had been disturbed or destroyed. After 1970 when NOAA was formed, the NOS official name was National Ocean Survey, reflecting the previous name of U.S. Coast & Geodetic Survey. 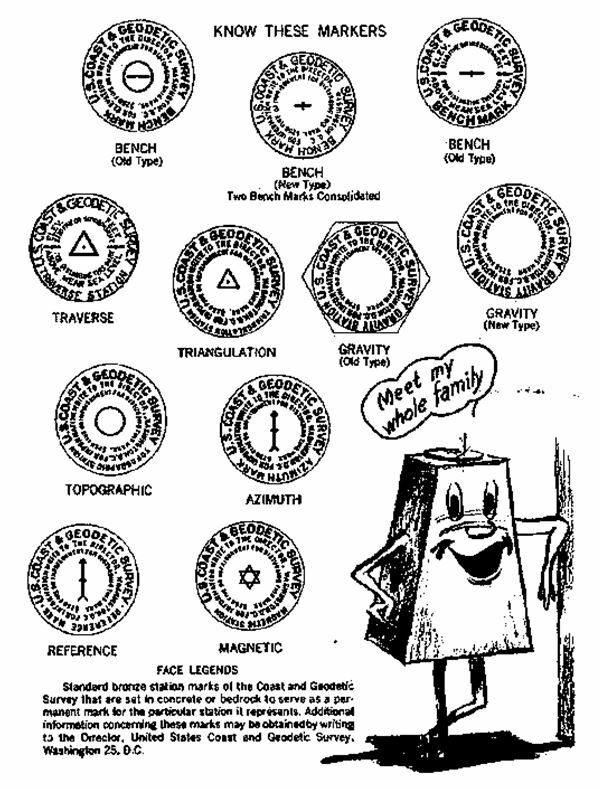 Disks stamped “National Geodetic Survey” were used starting in 1971 after formation of NOAA in the late 1970. In the U.S., some survey markers have the latitude and longitude of the station mark, a listing of any reference marks, with their distance and bearing from the station mark, and a narrative describing other reference features and the distance and/or direction of these features from the marks, and giving a history of past efforts to recover or reset of these marks. Zoom to your location of interest and search for geodetic control. Works Consulted Dracup, Joseph F. (Date Unknown). Geodetic Surveys in the United States – The Beginning and the Next One Hundred Years, 1807 – 1940. Retrieved October 24, 2006.